I woke up just before 4 AM, Wednesday, September 3rd. It was still dark out. Whatever clouds there were when I went to sleep seemed to have moved on. Even though I could see the lights of Pueblo in the distance, there was complete, dead silence. No cars, no engines, no insects-- nothing. It was incredibly peaceful. I fell back asleep, and woke up at 6:45. I seemed to be back on my regular sleep schedule. I went to the bathrooms, and tried out the coin-operated showers. It was like a toilet stall, except with a shower at the back instead of a toilet. Fifty cents for three minutes, no curtain. The water started out cold, but soon warmed up. I had change handy, and was prepared to plug the meter, but three minutes seemed to be plenty of time to lather, wash and rinse. It was a "Hollywood shower;" maybe I was a submariner in a previous life. 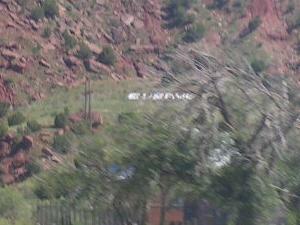 A family of four was camped at the next site over. They were up, cooking breakfast and packing away their tent. On my other side was an older couple in an RV. They went for an early morning walk, and waved as they went by. The wind was chilly-- it seemed to be in the 50's, I thought. Down the slope from my campsite, the lake was held back by a dam. 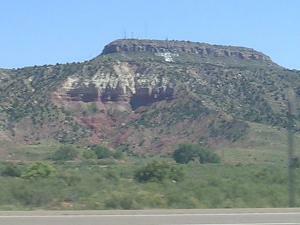 There were cliffs on the far side, and beyond them the city of Pueblo. Birds chirped in the trees. I sat at the picnic table and tried to catch up on my writing. There was a bottlecap on the table: somebody liked Peroni beer. I needed a shave. About 8 AM Mountain Time, I started up Satori and headed out. My first priority was gasoline-- I was running on fumes. The first convenience store I found was called Loaf 'n' Jug. I filled up with gas ($3.52 a gallon) and got a spicy breakfast burrito. Having something hot and spicy in my belly invigorated me. I was ready for the last leg of my journey. The road out of town was twisty and turny, and I thought I'd lost my way, but soon I was headed out of town. The road ahead pointed about as eastward as you could get. High, feathery clouds danced in the brisk sky. I couldn't find any good music on the radio. I did catch an advertisment for a housing project called the Shire. I wondered if the doors would be round...? I passed lots of trees and grazing lands and small farms. Pueblo must extend far out into the countryside, because I kept passing street signs. A building labeled Excelsior Middle School passed on my right. It was overgrown with grass and looked very closed. I crossed the Huerfano River, and seemed to have finally put Pueblo behind me. Flat, grassy plains stretched away from the highway. A squat, mossy-green ridge rose to the north, but soon even that flattened out. I'd left the Rocky Mountains behind me; the Great Plains beckoned. Cornfields appeared, fringed with clumps of black-eyed Susans. 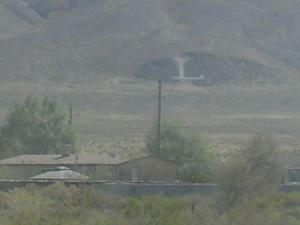 Just after 9 Mountain Time, I went through Fowler, elevation 4,343 feet. I was facing a tough headwind. A flag on top of a flagpole was almost blown flat out. The highway was a well-maintained 2-lane road, with a wide shoulder. Between the small towns, I managed to get up to 60 MPH-- even faster when I got past rolling roadblocks, like an annoying white semi that seemed to block my path for miles. I finally got around him and zoomed on down the road. The town of Manzanola was a little farming community. There was a big vegetable stand there, one of many I saw alongside the highway. People that had houses next to the highway sold produce out of their front yards. The town of Rocky Ford greeted me with the bounce of rumble strips in the road. Many businesses were long closed, like the Corporate Creamery on the west side of town, but the Tank 'n Tummy convenience store and Don's Shoes ("For Dad and Lad") were still open for business. I turned off the highway to take a picture just as the white semi caught up with me. As it drove on down the road, its engine seemed to cough a frustrated Hrumph! The westbound highway through Rocky Ford is a one-way street called Swink Avenue. Swink, Colorado (yes, I was still in Colorado) was just a few miles down the road. The highway dipped to go under the railroad tracks, a sign on the road warning "Do Not Enter When Water is in Underpass." At La Junta, I stopped at a stoplight in front of the new Wal-Mart. A trainload of coal cars rumbled by. About a mile down the road, I passed the old Wal-Mart, closed and for sale. 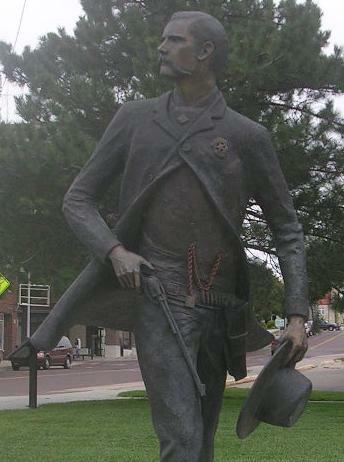 The La Junta town square had a gazebo and an old Santa Fe Railroad caboose. I was 56 miles from Lamar, on the old Santa Fe Trail. The highway ran straight as an arrow through miles of grasslands. It was hard to believe I was still in Colorado. 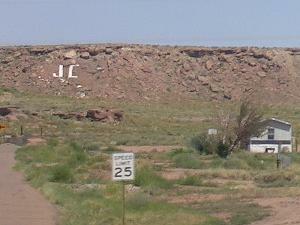 The road turned through Las Animas, advertised as "the last home of Kit Carson," although the famous frontiersman actually lived in nearby Boggsville. There was a statue in the town square. The old courthouse seemed to still be in use. The high school football team was the Trojans. Just outside of town, I crossed a lazy creek that turned out to be the Arkansas River. Down the road, I saw a pasture where sheep, cattle and llamas cheerfully grazed together. About 10:40, I made it to Lamar, Colorado. I made a pit stop at the Valaro Pit Stop, where they sold Spitz brand sunflower seeds, "Sunflower seeds with a difference." (Their website sells sweatshirts and "Spitz Bags.") The store sold fishing worms, too. Outside of town, visibility stretched out for miles in every direction. I kept losing pens, which was really frustrating when I wanted to write something down while on the road. Traffic came to a halt at some road construction. Many vehicles lined up behind me, including a white semi... No, it was a different white semi. Workers were rebuilding the road. Traffic was 1-lane for a couple of miles. I waved at the flaggers. Ever since working as a flagger on Exodus, I always wave at flaggers. The wind really picked up. Appropriately, wind-powered generators appeared ahead. The road went through a field of dozens of the huge machines; horses grazed on the rolling grassland below. I passed an abandoned house beside the road: no windows, no roof, just an empty shell. It had been so long since anyone lived there, grass had overgrown any path leading up to it. Everytime I saw an old house like that, I wonder, What happened here? Did people live their lives here? Were they happy? Did they leave because of a personal tragedy, or did opportunity for a better life draw them away? 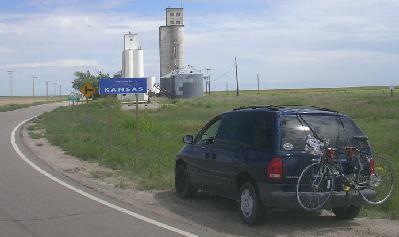 It seemed like it was taking a long time to get to the Kansas border when a town appeared ahead: Springfield, Colorado? I hadn't been traveling east-- I'd been traveling south! Nuts! 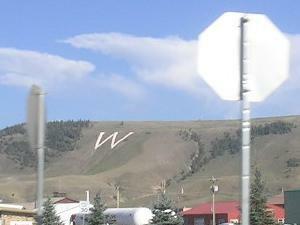 I blamed the wonky Colorado road signs, that only appear telling you where you are every 50 miles or so, and the huge wind-powered generators, so soothing and hypnotizing with their gentle spinning... Oh, who was I kidding? I was going down a strange road without paying attention and took a wrong turn, is all. Nothing to do but try to catch up. A quick check of the map said I needed to head east on Highway 160, through Johnson City and Ulysses. It was 12 noon when I found the turn for 160, just outside of Springfield. The narrow blacktop pointed due east through vast fields of corn, stretching for miles to the horizon. There were no other vehicles on the road, nobody in sight anywhere, so I opened up Satori, zooming 70 MPH and faster down the lonely highway. I thought, I may be lost, but I'm making great time! I slowed down to go through little towns like Vilas and Walsh. At least I was headed east again. My little misadventure only cost me an hour or so of drive time. I passed the time making up naughty songs. When I got to the Kansas border, the road was offset with the Colorado road by about 30 feet. Two narrow, 90-degree turns were necessary to cross the border. I thought, either some road engineers couldn't read their maps, or Colorado and Kansas have issues. I was back in the Central Time Zone again, living on Tulsa time. The only other vehicle I encountered was a blue pickup, which slammed on its brakes suddenly for no reason, making me jump to avoid rear-ending him. Jerk. I made it to Ulysses, Kansas, proud home of Olympic vollyball champion Sarah Noriega. I stopped at a little gas station for a pit stop (gas was $3.63 a gallon). The rest room key was on a chain with a lug nut. The girl at the counter said the quickest way to Dodge City was straight down the road until it linked up with Highway 56. More miles of corn passed, miles and miles of corn... and sunflowers! Acres of sunflowers, big as dinner plates. The unexpected bypass meant I missed It got really cloudy. At the 93/144 interchange, a sign said I was still 50 miles from Dodge City. It began to rain. In the little town of Montezuma, the main street through town is Aztec Street. I passed under more wind-powered generators 25 miles from Dodge, but I wasn't gonna let them get me lost again! It was almost 3:30 when I finally arrived in Dodge City. I followed the signs leading downtown. Beyond a roundabout, police were on the scene of a car accident in front of Leonard Tire Co., "Since 1915." I wanted to see the main street of Dodge City, which the town has preserved to look like an Old West town. At the Boot Hill Museum, I found a penny crushing machine and crushed some pennies for my collection. I called home, and talked to Nick. Everything was okay. The Missus was at work. I got some stuff to take home, and then looked for a place to eat. Hot wings sounded good. There was a place called Wing Street near the museum, so I stopped there for a late lunch. An order of wings, some tater tots and a soda came to almost $15, but I was hungry and didn't argue. The order took a long time, though. The only place to sit was a short bench, so I lied down on it, looking like some homeless person. That got my order up in a hurry. They didn't give me any ketchup, though, and I had to wait until they could "get somebody to help me." What, was getting ketchup a management decision now? I opened up my food and started eating right at the counter. That got me my ketchup. I could've cared less if their tater tots came in little "W" shapes-- I just wanted my ketchup. Just after 5 PM, I headed out of Dodge City in a light rain. Miles of flat cornfields went off into the distance. I thought of all those times on the TV show "Gunsmoke" when Marshal Matt Dillon would chase bad guys into "the hills outside of town." 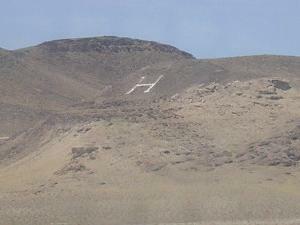 Hills? What hills? Western Kansas is as flat as a tabletop. A sign in a cornfield told me to HAVE A HAPPY KANS. The air was still chilly. Patches of blue started to peek through the overcast, afternoon sky. 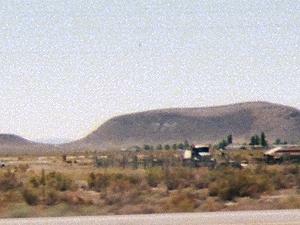 Grain elevators dotted the landscape. In Mullinville, Kansas, about a half hour from Dodge, a line of folk art sculptures lined up along the northern fenceline. No explanation. Coming into Greenberg, I saw that I was on the Cannonball Stageline Highway. Many buildings were still damaged from the devastating tornado that ripped through town in 2007. The Kiowa County District Court was set up in a trailer across the street from the damaged courthouse. A building with no roof stood next to a pile of rubble that used to be its neighbor. The grocery store was little more than a shell. I stopped for some gas (($3.59 a gallon) and had a short conversation with a very curious guy in a ball cap. He turned out to be the local cop. At a quarter to seven, it was getting dark. I figured I'd get to Wichita about 8. In the town of Cunningham, the liquor store advertised "Cold Beer, Warm Spirits." I was doing 65 to 70 between the little towns. Kingman, Kansas was celebrating its 125th anniversary. Signs declared it had "a past, with a presence." It was drizzling rain when I got to Wichita, shortly before 8 PM. From there on, it was interstate highways all the way home. I turned south on I-35, and forgot it was a toll road. It was only $1.60, but still. At 8:39, I crossed the border into Oklahoma. About 40 minutes later, I turned east on Highway 412 and paid another toll-- twice ($1.75, and then 75 cents down the road). Wind and rain really started hammering the van. Oklahoma was getting the remnants of Hurricane Gustav. The rain let up a little just as I turned off the highway into Broken Arrow. I rolled up into the driveway right at 11 PM. I was home. Satori and I had traveled 3,750 miles in 13 days. My experiment in drawing versus photographing at Burning man was ...inconclusive. Sketching people brought compliments and encouragement. However, nobody gave me any hassles about taking their photograph, either. It may be the whole online debate was simply a vocal minority making a mountain out of a molehill. I'm glad I had a chance to get some drawing in; that was fun. 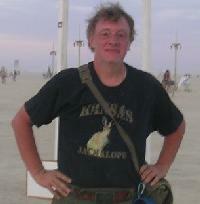 I remain convinced that Burning Man is a public event, and that it's legal to photograph anyone in a public area. There's thousands of people at Burning Man, and a big percentage of them are going to take photographs. It may be easier to not stress out about it and just accept the fact that if you're at Burning Man, you're probably gonna get your picture taken. People that don't want to get wet should think twice about jumping in the ocean. I feel much better about Route 66 these days. It's even kinda fun to think about. I'm glad I took the time to make those side trips. The next long trip I take, however, I'm gonna break it down into shorter segments. Thirteen hours on the road is too much for one day. Within a month of returning home, gasoline had dropped almost a dollar a gallon. Four days after I returned from my trip, I was going home from a visit to my Mom's house when I noticed the power steering was a little stiff. As I drove down the road, the lights flickered. The automatic door locks started locking and unlocking by themselves, and my dashboard clock disappeared. It was like Satori was possessed or something. I finally pulled over and called AAA. Remember when I said I had the belts replaced? The final analysis was that Satori's serpentine belt had come loose because one of the engine pulleys failed. It could've happened at any time during that trip. 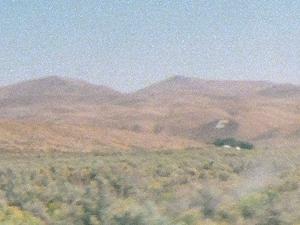 I'm astounded that I went all the way to Burning Man and back, 3,700-plus miles, without any problems at all. There were a zillion places it would've really sucked to break down. Disposable cameras are convenient, and you can get some good pictures, but it costs more to have the film developed. Late one night on the playa, it seems Hair of the Dog had a visitor. Some guy showed up and said that his father recently passed away. His father was a bartender, and it was his wish that, after he died, his ashes be scattered in a friendly bar. Remember when I said I collected some dust from the bar in a bottle..? Yeah. I think I came back from Burning Man with some dead guy's ashes in my gear. The bottle now sits in a place of honor on my living room shelf. I call him Uncle Larry.